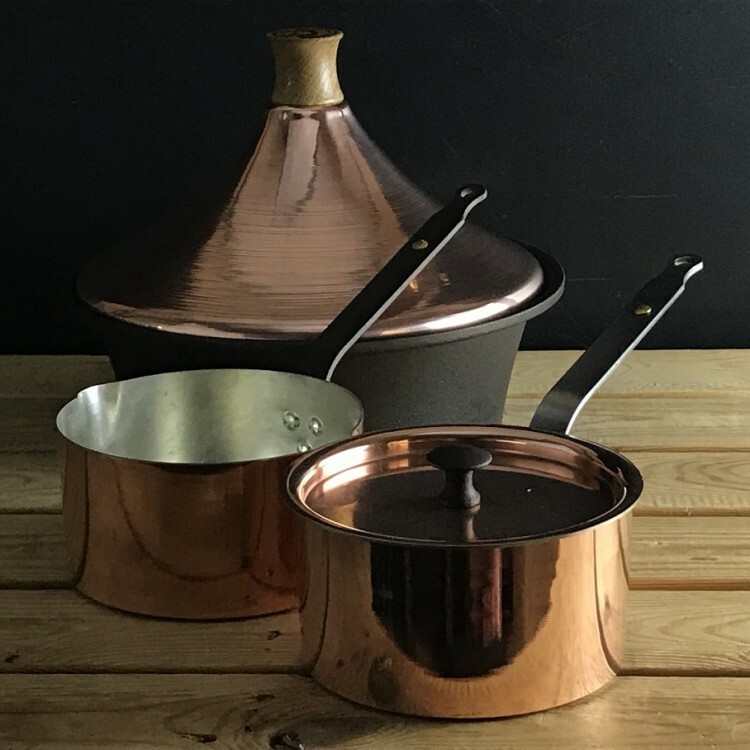 Home » Product care » Care of copper pans and tagines. After use, leave your pan to soak in soapy water to loosen any stuck on food. Use a non-abrasive sponge or cloth and warm, soapy water to clean your pan. Rinse and dry thoroughly. Do not use an aggressive scourer, or you will rapidly wear through the lining. Never put copper pans in the dishwasher. Netherton Foundry copper pans are lined with tin. These linings may discolour over time. This isn’t a problem. Your copper pan may need to be re-tinned at some point over its lifetime. This is only needed if you start to see copper showing through the lining. Over time a greenish patina may develop on a copper surface. This is perfectly fine on your pan if it is not going to touch the food. If you want to remove this, the pan can be polished using a copper cleaner and a soft cloth, then rinsed with water and dried thoroughly. This should keep the copper looking shiny. The handle is made from raw black iron & will need thoroughly drying after use or it will rust. We suggest coating the handle with a thin wipe of olive oil or bees wax to prevent rusting. Do not leave your pan on the hob unattended for too long; if you boil it dry, the lining will melt. The tin lining will melt at 232ºC / 450ºF. If you place your pan in an oven, it is best not to go above 180ºC / 356ºF. The tin lining is not covered by the warranty as we cannot predict wear and use. The biggest causes of rapid wear are metal spoons and whisks, so please only use wooden or silicon utensils. Thomas Gameson and Sons Ltd, they’ve been doing this for 200 years.